On Friday veteran filmmaker Sanjay Leela Bhansali was assaulted and slapped by the members of Karni Sena. The members of Karni Sena did protest against Sanjay Leela Bhansali who is shooting for his next film ‘Padmavati’ at Jaigarh Fort in Jaipur. In a video that has gone viral, in that we can see how protesters are seen damaging the cameras and the other shooting equipment while raising slogans. In significant number, the protester had entered and had started getting violent before the crew could think of doing anything. Further, the protester had surrounded Bhansali who was sitting in front of the monitor. 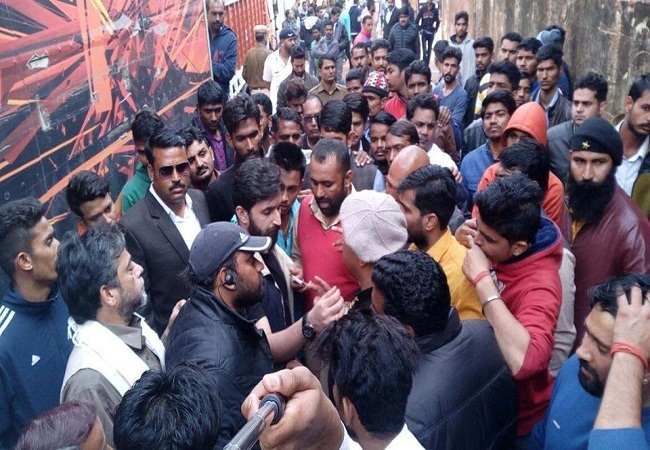 On the other hand, the crew of ‘Padmavati’ tried to take Bhansali to safety but the protester reached the defenseless director and had assaulted and slapped Sanjay Leela Bhansali. Later, the protester had turned towards the costly equipment and smashed all the equipment on the ground that they could get in their hands. None of the actors- Shahid Kapoor, Deepika Padukone and Ranveer Singh was present on the set during the ruckus. Karni Sena activist, Vikram Singh has said that we are protesting against the wrong facts that are presented in the film ‘Padmavati.’ He has further added, our protest is about the distortion of historical facts, and that will not be tolerated. Earlier, the same body has done the protest against Ashutosh Gowariker’s film ‘Jodhaa Akbar.’ Karni Sena has raised their objection against the film ‘Padmavati’ which is incorrectly portraying Rani Padmini. Police were called to the spot which soon escorted Bhansali to safety and had arrested the protesters. Temporarily the shooting for the film has been halted. Founder of Karni Sena, Lokendra Singh Kalvi has said that we had learned that in the movie there are few intimate scenes between Padmini and Alauddin Khalji that is completely unacceptable for us. Later, Lokendra Singh Kalvi has said that the police after the police was involved, a meeting held between filmmakers and Bhansali and we have assured us that there are no intimate scenes in the film. He has also said that we won’t tolerate the distortion of history and we will be satisfied after seeing the film. 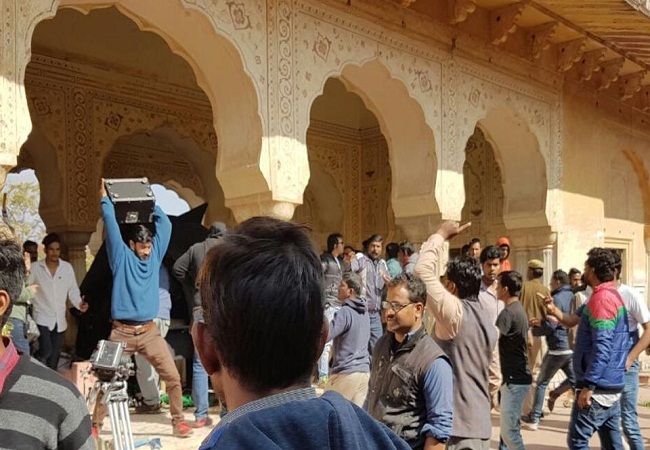 The film industry has come together against the attack on Bhansali during the shooting. 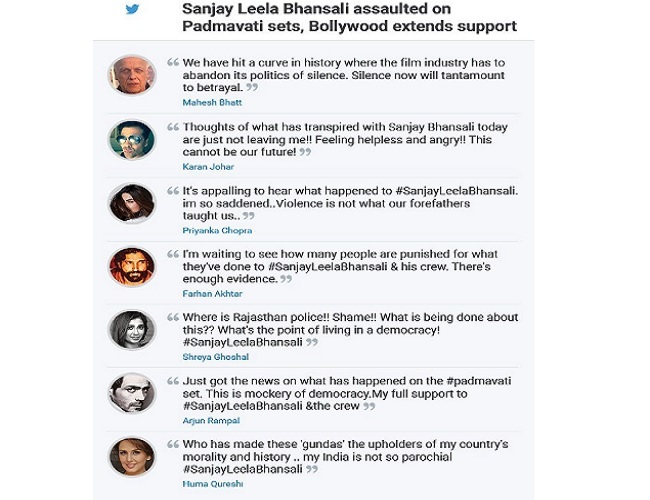 Celebrities have rallied their support to Sanjay Leela Bhansali and have also written on Twitter about the incident. Having been through many instances of turmoil during a film shoot or release…i understand Sanjay’s emotion at this point…I stand by him. How do you take justice in your hands without knowing what the facts are. Shameful! So much for Karni Sena’s reputation. With you Sanjay! It’s appalling to hear what happened to #SanjayLeelaBhansali .im so saddened..Violence is not what our forefathers taught us..